The folks at WordPress.com are really working doubly hard these days to improve on the services they offer to loyal users of the free WordPress hosting site. After the geotagging and emails subscription features, here’s another better and more useful feature – posting and reading via Twitter API. The new feature is supposed to work with mobile Twitter applications which use the Twitter API. Of course, it was tested on an iPhone application, particularly Tweetie 2.0. But the feature should work on any third party app that allows you to set a custom API URL. 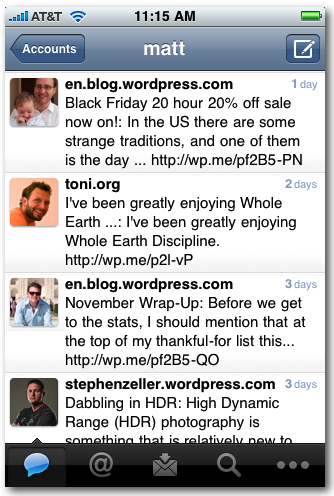 To enable posting and reading to your WordPress.com blog via Tweetie 2.0, you need to add your WordPress account to Tweetie just like you are adding another Twitter account. To make it work, you need to add https://twitter-api.wordpress.com/ to the API Root field before adding the account. 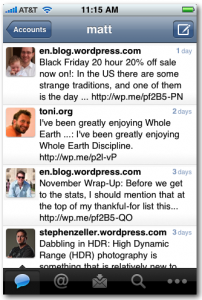 Once your information is verified by Tweetie 2., you can then start posting to your WordPress.com blog using your iPhone’s Tweetie 2. app. If you’re having problems setting up your account, full details can be found here.